(17/P13) TRENTON – The Department of Environmental Protection’s Division of Parks and Forestry has launched a pilot project to install wooden barriers to protect ecologically sensitive intermittent ponds in Wharton State Forest from damage caused by illegal use of off-road vehicles as part of a comprehensive enforcement and education effort to protect ecologically sensitive resources in the park. The initial phase of the project targeted four ponds, using volunteer help from varied stakeholder groups. It is part of a broader effort to protect ecologically sensitive areas in the 125,000-acre state forest. Wharton, by far the largest unit of the State Park System, is located in the heart of the globally unique Pinelands National Reserve, and covers parts of Atlantic, Burlington and Camden counties. “This effort, a collaboration of environmental groups, off-road vehicle groups that advocate for responsible use of unimproved roads in Wharton, and other stakeholders, builds upon our ongoing efforts to strike the right balance in protecting the natural resources that are unique to this region, while recognizing that Wharton has a long history of being enjoyed by varied user groups,” said State Park Service Director Mark Texel. 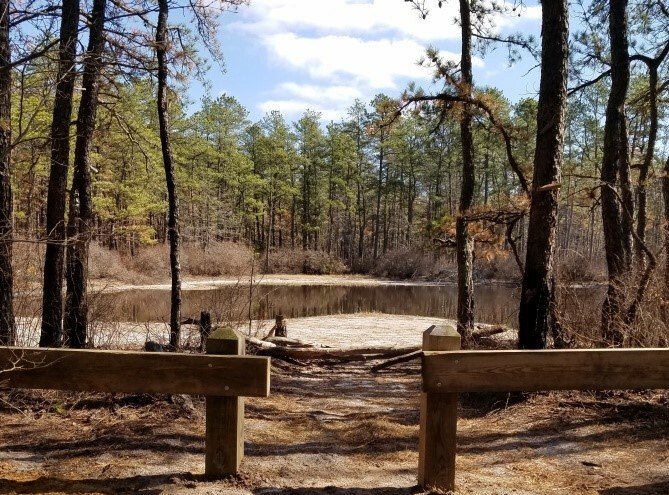 Intermittent ponds are shallow depressions found throughout the Pinelands that periodically dry out as the region’s shallow ground water table fluctuates. 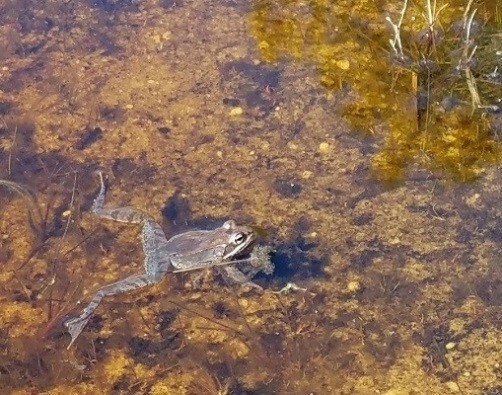 They are ecologically important because they provide breeding habitat for many of the region’s unique amphibian and plant species. Fish that would otherwise eat the eggs and larvae of the Pinelands unique amphibian species cannot populate these ponds due to their fluctuations. Some of the species, such as the Pine Barrens tree frog, are found in few places outside the Pinelands. 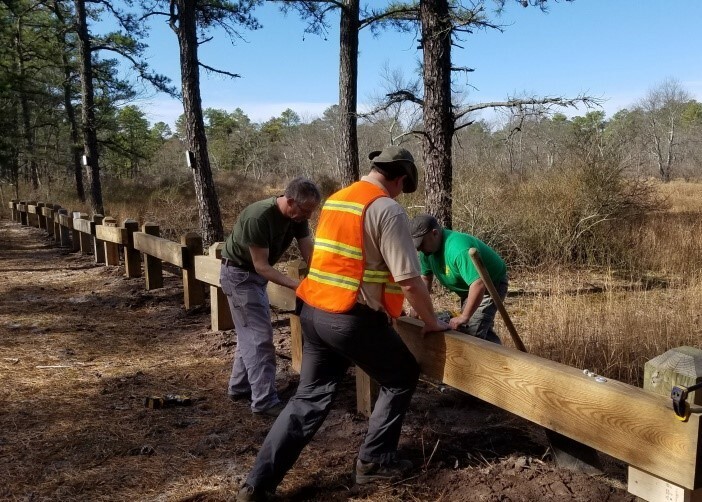 Park Service and State Forest Fire Service personnel worked with volunteers to place timber barriers around access points to the selected ponds. Small gaps were left to allow pedestrian access. The New Jersey Pinelands Commission science staff provided guidance on areas suited for the project. Frogs could be seen and heard while the workers were erecting the barriers. 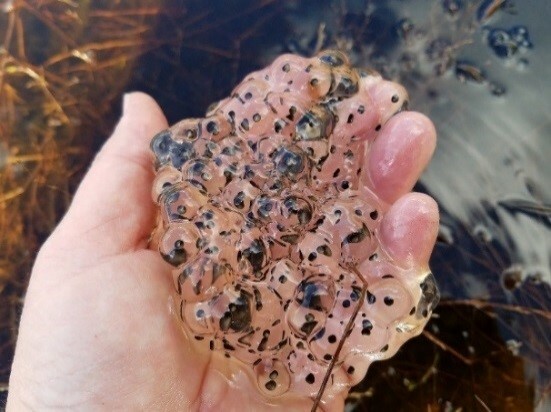 Large egg mass clusters were also present in the ponds. Some off-road vehicle enthusiasts run their vehicles through these ponds both during their wet and dry periods. In the process, their tires leave deep tracks in the ponds and destroy plants that fringe them. Organizations involved in the effort were the Pinelands Preservation Alliance, Iron in the Pines, Open Trails NJ, NJPineBarrens.com, the South Jersey Botany Group, the New Jersey Trail Riders Association, South Jersey Geocachers, the Gossamer Hunting Club and the Whitesbog Historic Trust. The barriers were erected Feb. 25. The project complements a comprehensive education and enforcement effort designed to reduce environmental damage in Wharton, which has become popular for off-road vehicles because of its vast network of sand roads and many access points. The effort, which includes a special Park Police unit dedicated to enforcement, is designed to make sure that only street-legal vehicles use the forest roads and that they remain only on clearly established unimproved roads. As part of this effort, ecologically sensitive areas have been posted with signs warning vehicle users to keep out. Park Police have focused patrols on these areas. 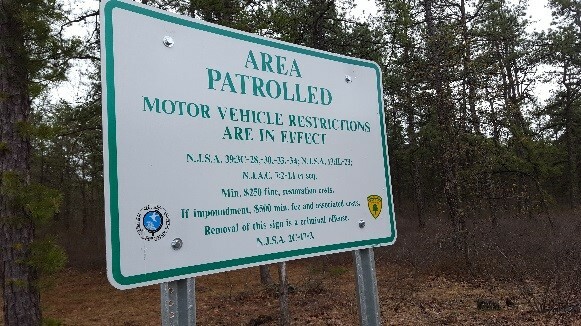 Some 60 entrances to the state forest have also been marked with signs reminding the public that motor vehicle and environmental laws are being enforced. MEDIA NOTE: For more photos, including before and after pictures, contact the DEP Press Office at the above numbers.